can anyone please guide me again what could be the possible problems/issues? Because I m not able to load data to HDFC and nor I can run the MapR jobs, having error message on running the jobs. Can you describe the steps your are taking to connect to these services? Are you using a web browser inside the VM, on your local laptop? Please post the errors or screenshots also. "Firefox can't establish a connection to the server at maprdemo:8443." MapR takes a long time to start up, sometimes 10-15 minutes, if after about 15 minutes if it does not start up then try restarting the VM. Also, just try to go http://maprdemo:8443 you will then see a page that lets you pick between Hue and mcs. thanks. 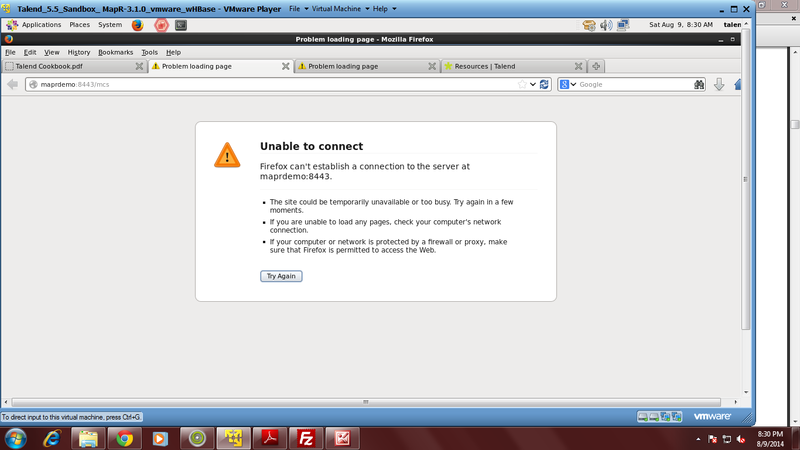 I've tried everything you mentioned but still unable to load http://maprdemo:8443 from the browser within my VM. I m giving my system's specification so you may guide me where the problem is residing? We recommend 8GB of RAM for Sandbox. My guess is you don't have enough memory for the VM. Give the VM as much memory as possible, if you can give it 4GB and stop everything else on your machine so the VM can get all 4 GB. Then in your VM don't open anything other then the browser, leave Talend closed until you get mcs started. With such little memory MapR will take even longer to start so maybe 15-25 minutes. If it starts the mcs console will show the memory usage for MapR it will be at the max. When you start Talend Studio it will take some memory as well but the VM should balance. The lowest I was able to get the MapR to run successfully was at 6 GB of RAm allocated to the VM so you may not have enough memory for MapR and Talend to run. Thanks Talend team! I was also wondering if its the memory problem I am having. I'll upgrade my system's memory soon and then will inform you about resolved problem.